UPDATED: Tue., Feb. 12, 2019, 11:54 a.m. The sample size is fairly large, but most who’ve followed Gage Gubrud through his career at Eastern Washington would contend the quarterback’s finest hour with the Eagles came three years ago in his first start, against the very Washington State program he’ll be suiting up for this fall. In a 45-42 upset win at Martin Stadium, Gubrud passed for more than 470 yards and five touchdowns while rushing for more than 70 yards and adding a touchdown on the ground. Wide receiver Cooper Kupp was excellent, but Gubrud may have been even better in a game that set the stage for one of the most prolific careers by a QB in school history. Gubrud went 21-7 as EWU’s starter, was twice named a finalist for the Walter Payton Award and finished his time in Cheney with 101 all-purpose touchdowns and more than 11,000 all-purpose yards. Before Gubrud throws on the crimson and gray for the first time, we count down five of his best games in the Eagles’ red and black. Gubrud set a high bar for himself in the first start of his career. He’d win many consequential games against his Big Sky competition – and multiple FCS playoff games – but the season opener in 2016 still stands alone as Gubrud’s best feat, and it’ll certainly be a talking point in his new locker room this season. WSU would win eight games and lose to Minnesota in the Holiday Bowl that season, but on Sept. 3, the Cougars had no solution for the FCS QB-WR tandem of Gubrud and Kupp, which would account for 12 passes, 206 yards and three touchdowns. For all Gubrud accomplished through the air that day, the redshirt sophomore also rushed 14 times for 77 yards and the play that decided EWU’s 45-42 victory came on a read-option that saw the QB fake a handoff to Antoine Custer before darting through the heart of WSU’s defense for a 30-yard touchdown. There were some nervy moments for EWU fans when the Eagles traveled to UC Davis in early October 2017. EWU scored first with Gubrud hitting running back Sam McPherson over the middle for a 40-yard touchdown, but the Eagles relinquished the lead early in the second quarter and trailed by as many as 11 points in the fourth. That’s when their signal-caller took control, unleashing consecutive TD passes – a 70-yarder to Nsimba Webster, a 6-yarder to Talolo Limu-Jones – to give EWU a three-point buffer with nine minutes play. But the Aggies found their way back into the end zone to take a 38-34 lead with 4:45 left, putting the ball – and the game – in Gubrud’s hands. Eleven plays and one gutsy fourth-down conversion later, EWU’s offense was back into the red zone. Gubrud took a shotgun snap from the 6-yard line and sat in the pocket before coolly throwing a pass to Nic Sblendorio near the far right pylon. The Aggies saw Gubrud just twice, but anybody playing defense for Davis during that span would say it was two times too many. The Eagles scored 104 points in those games and Gubrud was particularly productive, completing 66 of 99 passes for 938 yards, 12 touchdowns and two interceptions. He and Kupp picked the Aggies apart in a strange game on the red turf in 2016. The score indicates a wire-to-win for the Eagles, but the game was in limbo until the third quarter. EWU opened with a 14-0 first quarter, but Davis followed with a 23-0 second quarter to take a nine-point lead. No problem. Gubrud and the Eagles came out firing in the third and the QB contributed five touchdowns – four passing, one running – to a 49-point second half for the home team, which won 63-30. 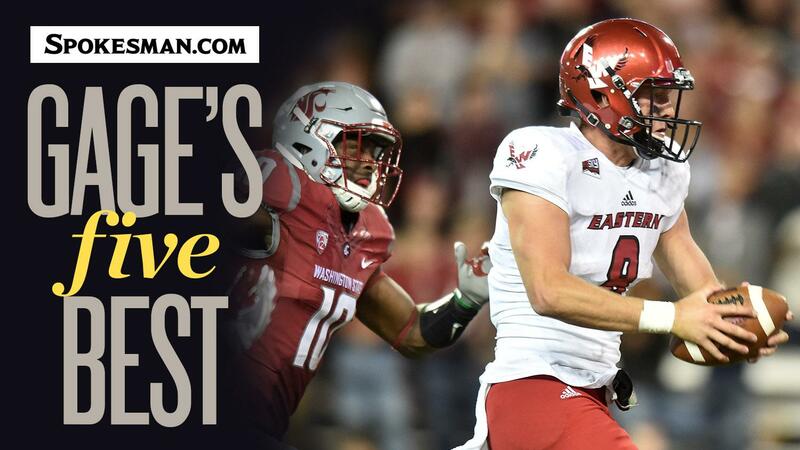 Gubrud’s senior season in Cheney was truncated by a toe injury, but the Eagles went 4-1 in the games he played in – the only loss coming at WSU – and none of those were more exciting than a rare nonconference matchup between Big Sky rivals EWU and NAU. Gubrud and the Eagles made the first quarter a sprint, and EWU found itself up 14-0 after touchdowns to Jayce Gilder and Webster – the first coming at the 11:55 marker and the second at 10:15. In a game that saw Gubrud and Webster hook up frequently – seven times for 176 yards when all was said and done – the QB and his speedy receiver connected for their second touchdown in the second quarter. The second half lacked the offensive fireworks of the first half, but the Eagles won 31-26 nonetheless and Gubrud completed 18 of 33 passes for 322 yards and four touchdowns, while rushing six times for 88 yards. If he wins WSU’s starting job, Gubrud would get one more crack at an old Big Sky rival this fall when the Cougars host the Bears on Sept. 7. He was nearly perfect in his debut against Northern Colorado – a 49-31 win for the Eagles that saw Gubrud go 33-of-39 passing for 435 yards and five touchdowns. EWU trailed 17-14 at the break, but Gubrud’s first TD – a 29-yarder to Shaq Hill – put the Eagles back in front and opened the floodgates. Gubrud went to Hill for three more TDs and threw another to Sblendorio. Published: Feb. 10, 2019, 8:37 p.m. Updated: Feb. 12, 2019, 11:54 a.m.